Last week, we said goodbye (for now) to our beloved parking patio in front of The Two Twenty and Collective Coffee. After one season of use (May—October), we wanted to know what kind of impact the patio had on the street and the neighbourhood, and whether it was appreciated and enjoyed. As much as we love parking patios and other innovative urban interventions, we wanted some real data to back up the anecdotes. We'll shout from the rooftops all day long about how awesome they are, but when it comes to civic policies, numbers speak louder than stories. It's our hope that City Hall will benefit from this information just as much, if not more, than we will. We sent around an anonymous survey via email and social media, and received 48 responses. Overall, respondents enjoyed the heck out of the patio, wanted to see it return next spring, and even had some ideas for improvements. Read on if you're interested in the results. A word cloud of the overall impressions of the parking patio. The size of each word corresponds to how often it showed up in the responses. We personally loved the patio of course, and we knew that many others in the Two Twenty community did too, but we had no idea just how much! The overall impressions were overwhelmingly positive. The phrases "It was awesome", "Loved it", and "Great idea" came up several times each. Additionally, almost 90 percent of respondents said that they appreciate the availability of additional public outdoor seating on the street. Combining this information, it becomes very clear that our community was very happy about the existence of the parking patio. Usage, however, is another story. We asked how many days per week, on average, each respondent used the patio. Two-thirds of respondents said one or two days per week. Admittedly, this seems like a low amount. If the majority of survey respondents only used the patio once or twice a week, that must mean that the patio is worthless... Right? An outdoor sidewalk patio is not a workplace, living space, or any other major part of our daily lives in any way. It's an occasional treat, happened upon by chance and used in passing, either while waiting for something else or when faced with a need to sit. It's not an attraction—its primary function is to simply exist in the background. 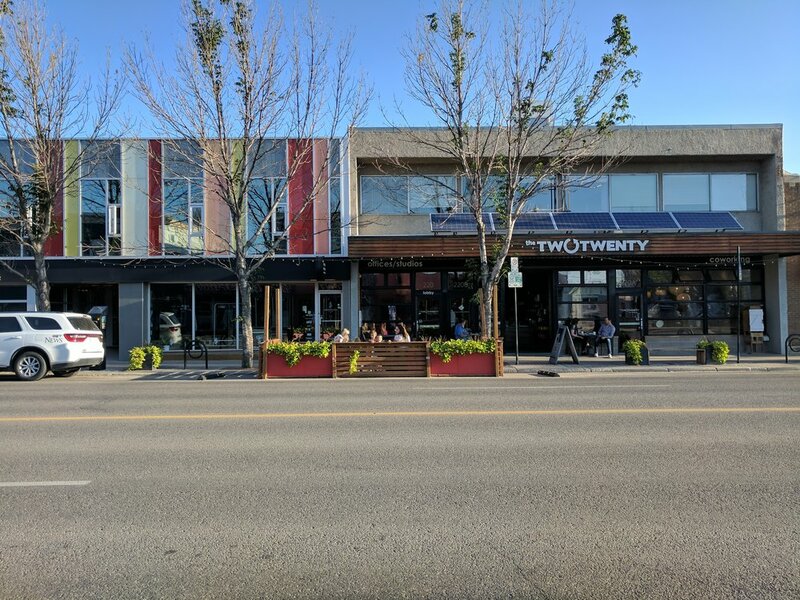 Furthermore, and maybe more importantly, a major segment of those who benefit from a parking patio located along the sidewalk are the people not using it—passers-by who enjoy a slightly more pleasurable walking experience because of the inviting, people-oriented space created in that spot. This is not just conjecture on our part. 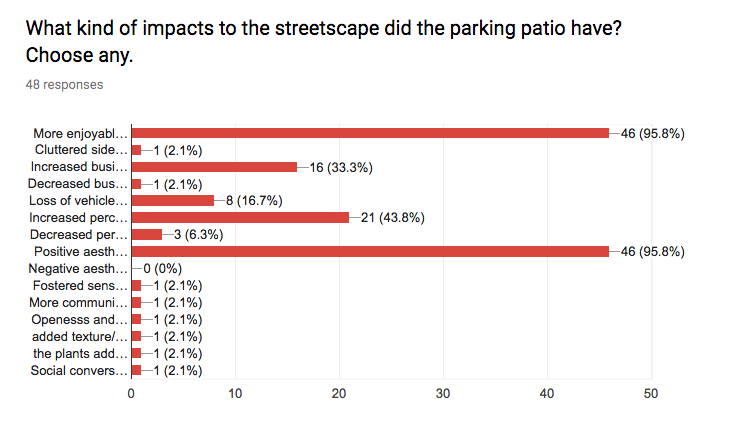 More than 95% of survey respondents said that the impacts to the streetscape as a result of the parking patio included "a more enjoyable, people-friendly sidewalk" and "a positive aesthetic change." So, don't be discouraged by what appear to be low usage numbers. And don't make the mistake of looking at raw usage data as the only indicator of success when it comes to urban streetscape interventions. 2 suggestions simply requesting more parking patios. Finally, to wrap it all up, we asked respondents about their thoughts on the future of this patio and others. All but one respondent said yes, they would like to see the parking patio back next year. 43 out of 48 (89.6%) said they would also like to see more parking patios in Riversdale. When it comes down to it, these last two questions are really all the feedback we need. But we like to go above and beyond. Thank you to everyone who completed the survey, who used the parking patio, or who just appreciated its existence. Catch you on the patio again next year! I'm not a car driver, but these little patios make cities more welcoming, livable, and walkable. Thanks for the beautiful space. I appreciated the added greenery and social connection space. I like that it was an open space, not just for restaurant or coffee shop patrons. I would love to see design elements that acknowledge the character, ethnicities, and identity of the neighbourhood.